Today is the winter solstice – the shortest day (and longest night) of the year. I have been thinking a lot about light and dark in the last couple of months. I think the doom and gloom of the general news – the continuing wars, the sinking economy, the bombings in Mumbai, the layoffs of many friends, etc. – has made me focus too much on the bleak side of life and I want to make a choice towards the light. And I don’t have to look far for inspiration at this time of year when so many religions focus on the light. Jews commemorate Hannukah, the Festival of Lights, at this time, lighting one candle on the menorah every night for eight nights. Pagans, too, have long celebrated the birth of sun at the midwinter solstice, in a festival they call Yule. And Christians celebrate the birth of Christ, their light of the world, at this time, too. So on this darkest day of the year, I want to share with you some prayers from several faith traditions that focus on rebirth, light, life and the renewal we all seek and hope for at this time of year. I hope there is something here for every form of prayer bead – the traditional Catholic rosary, the new Anglican rosary, the various pagan prayer beads and the malas of the Eastern traditions. of bramble, sparrow and damp, dark earth. Like a seed dying and living. Make me short on mean thoughts, long on offers words of comfort. Make me short on focusing only on my own, long on looking beyond. Make me short on tradition as a habit, long on rediscovery and re-owning. Make me short on rushing a tiring, long on walking and wondering. Make me short on false, festive jollity, long on stilling and rooted joy. Dear God, help me embrace the darkness of this day, knowing that from the very deepest dark comes the brightest Light. Help me to feel my own darkness, where fear resides inside, within my wounded child who is scared of being on Earth. With your love, I may use the darkness of nature on this day to hold my wounded child close to my breast, letting her tell me all of her fears. She will tell me how I scare her; I will ask her to tell me how I abandon her. I will use this darkness to let her cry; and with her final tear she will begin to sense the Light. I will use this day to go to the depths of my own dark places because I know you are with me always, and that only by going into the darkness may we see the truth of our Light. Thank you, God, for giving me life so that I may explore the darkness and the Light. Thank you for the cycle of creation. Thank you for my breath, my heart, my body and my mind. Thank you for the Light of my soul, where, though I sometimes forget, I long to always be. Commanding us to kindle the Hannukah lights. In the days of lng ago. And in this time. Happy prayers and love to all! commanding us to kinkle the Chanukah lights. There was a great article in Friday’s New York Times’ Escapes section on people going to Hindu ashrams and Buddhist monasteries to take a break from their bust lives. That in itself is not a new story. What is new – and fascinating – is that vacancy is way down at these places because people who are not Buddhists or Hindus – and in some cases are not even aware that the ashram is dedicated to a spiritual leader – are attracted by the simplicity of the meditation, chanting and work that make up the daily routine. So, take a look at the article – by Shivani Vora – and maybe make a trip to an ashram, monastery or other spiritual retreat near you. You can take your prayer beads – Buddhist or Hindu mala or Christian rosary or any other kind you like – and spend part of your free time there with them. Or take them to one of the chanting sessions and give it a try. I wish I could go! Firstly, may your blues rise unto the sky and provide the landscape for the clouds to live. Secondly, thanks for sharing such a wonderful prayer. Thirdly, Thank you for such an exquisite book. I have no doubt that your treatment of this subject, the making and using of prayer beads, will enhance the spiritual lives of many folks from different denominational and religious backgrounds. My wife and I are making the commitment to return to the Episcopal Church after a hiatus of ten years. Your discussion of the Anglican Rosary has already enhanced our path. I’m looking forward to using the Anglican Rosary in my daily life. This will involve making a small change in the beads in my pocket. You see, I’ve carried malas with me for over 20 years as I’ve practiced and lived a bi-religious path: Buddhist-Christian. Not being Catholic, my experience with the Catholic Rosary has been rather superficial. However, having been a practicing Buddhist for over 27 years, and discovering malas 7 years into the journey, I thought that I’d only carry malas with me for the rest of my life. My wife and I were confirmed in the Episcopal church 26 years ago this month. 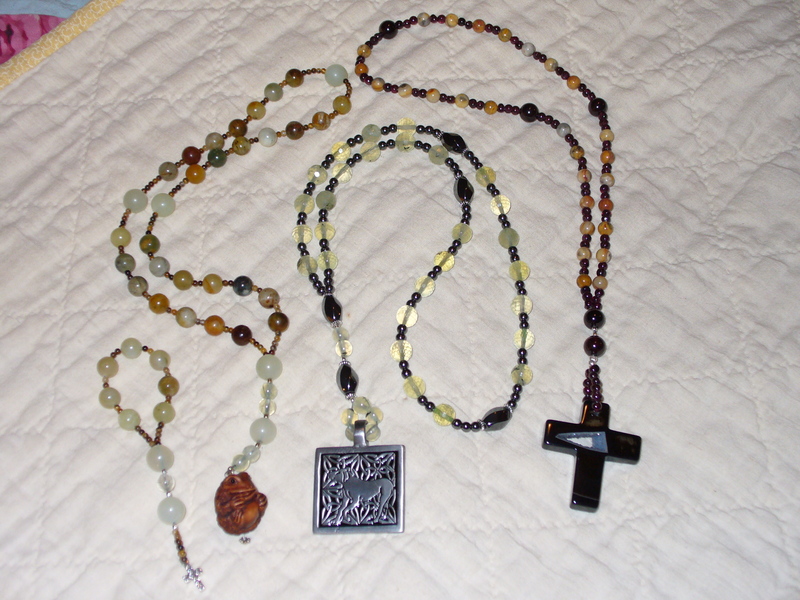 Yet, “way back then”, I had never heard of an Anglican Rosary so all of my beads were Buddhist. My Buddhist path moved from the study and practice of Zen, to the borders of Tibetan Buddhism in 1989. The first of a number of initiations followed shortly thereafter. It was a little over 10 years ago that I took refuge vows and became a “card carrying Buddhist”. Living as a Christian and a Buddhist simultaneously has been an interesting experience. In fact, much of my academic training ( I received a B.A. in Philosophy &amp; Religion from Western Kentucky University in 1980) led me to believe that this was an impossibility. However, I was able to walk within both paradigms at the same time…..never far from my malas. As you may know, within Tibetan Buddhism, various initiations (wongkur) require the repetition of various mantras. Some of the required mantra repetitions are in the hundreds of thousands. For my guru yoga practice I had one mantra to repeat 250,000 times. I had one mala that was only used for this practice. It had two strings of counter beads attached to the 108 bead mala. Using the counters I could keep track of up to 10,000 repetitions. At that point I had to fall back on some small stones, each one representing 10,000 mantra representations. Then I could start my 10,000 count again up to 20,000, and so on and so forth. I had practiced Buddhist meditation methods ( a dozen or more different types of meditation) for more than a decade before agreeing to take refuge vows. However, the process takes some time. I attended 6 one-day long retreats held at one month intervals going through the Foundation Series. This series acquaints you with the basics of Buddhist thought and practice. The Series ends with the opportunity to “take refuge”. This link shows you the new (5 part) series taught in Atlanta at Drepung Loseling….by the same teacher who taught our class in 1998. On February 1, 1998 I took refuge in the Buddha, the Dharma, and the Sangha. This formalized my Buddhist commitment and identity. What I like about the Geluk school’s Refuge ceremony is that it is rather straight forward and easy to understand. This link will fill in a lot of details about what it means to take refuge. 1.) Gate gate paragate parasamgate bodhi svaha! 2) Om mani padme hum! 4) Om muni muni maha muniye soha! 5) Tayatha Om bekanze bekanze maha bekanze radze samung gate soha! What I’ve done over the years is do a round of 108 repetitions of any one of these mantras, while in my pocket, while walking down a sidewalk, through a mall, etc. The repetition brings my mind back to a calm and alert state and sweeps aside the usual self centered commenting going on in my mind. My two favorite mantras are # 2 and #5 in the list above. The #5 mantra is the mantra of the Medicine Buddha. My first Tibetan Buddhist initiation ( wongkur ) was in the practice of the Medicine Buddha. To be accurate in answering your question about the 250,000 mantra repetitions I had to pull out my booklet received when undertaking the training for the Guru Yoga of Lama Tsong Khapa. This entire sadhana [spiritual practice], which takes between 25 and 40 minutes to complete was supposed to be done 100,000 times. Contained within this sadhana were a number of mantras that were to be performed 3 times, 7 times, 21 times or 108 times. Many of us students would usually practice with the 3 times or 7 times repetitions of the mantras. Thus, if we did the entire sadhana 100,000 times we might repeat certain mantras 300,000 – 700,000 times! This takes years to accomplish and becomes a significant base of ones Buddhist practice within the Tibetan Buddhist ( Geluk School ) tradition. Thanks, Rod, for sharing this intense practice! I wish you and your wife all the best in your return to the Episcopal Church. Got this fabulous message from Sharon Renick, a prayer beader who lives in Trinidad, Texas, about 70 miles southeast of Dallas. I wanted to share it with you because it illustrates the serendipity of faith, the value of spiritual practices like prayer beads, and the power of taking control of your own prayer life and relationship with God. “I want to share with you how I came to know about prayer beads. I’m not the best house keeper in the world. I’ve also had many different hobbies over the years. So, when I start looking for that one particular thing, it can turn into a rummaging around hunt through a lot of different boxes. One day I was looking for some beads and had pulled out several boxes of stuff. I finally found the beads and started putting the other things away. When I had finished, I noticed a book, A String & A Prayer, by Eleanor Wiley [and Maggie Oman Shannon] laying on the table near where I had been placing things. I didn’t remember putting the book there. I didn’t remember seeing the book in any of the boxes I had gone through and I didn’t remember ever buying the book. I have no idea how long I’d had it, but I was supposed to find it that day. I read it, savoring every word. It spoke to me in a way that nothing has in a long time. I looked at Eleanor’s website. I found your website and started hunting for your book. I finally had to order yours online because I couldn’t find it anywhere I went. While I waited for it to come in, I read every entry in your blog back to the beginning. Getting your book in the mail that day, was like a having Christmas! Now, I carry both books around and I’ve started a prayer journal where I write the prayers that speak to me. I also can’t stay off the beading sites! “I’ve never attended a church regularly in my life. My father had actually wanted to be a minister when he was very young, but turned away from God around the age of 14 when his mother died. So, we were not bought up in the church. My husband was raised Catholic, but does not practice the religion at all and never even talks about it now. I try to respect his wishes and not press him on the subject. So, I have no particular denomination other than being Christian. “I’ve only been making rosaries for a little over a month. My favorite prayers so far have been the ones that I’ve gotten from your book or website. I love the Julian of Norwich Prayer, the Lord’s Prayer, the Jesus Prayer, several of the Psalms and the Serenity Prayer to name a few. My husband has constant back pain, so I’ve adapted one of the prayers in your book for him. It’s the one that was adapted from The Book of Common Prayer and is listed as a Prayer of Healing. I use it almost every night. The first time I read the Merton Prayer (I think it was on your website) I cried. I often say it as one of my final prayers of the night. It’s just beautiful. “I almost always use a variety prayers each night. 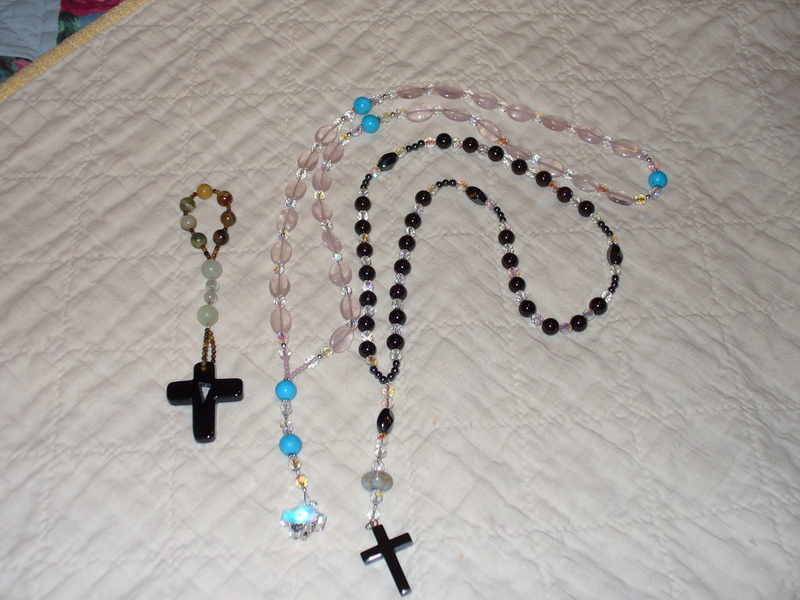 I may use four different ones on the weeks and two different ones on each of the other beads or groups. I’ve found that I really enjoy so many of them, that I hate to limit myself to repeating the same ones, most nights. Sharon’s beautiful note just about did me in. I started to cry. It is stories like hers that make all the writing of the book – the solitude, the self-doubt, the feelings of inadequacy to the task – absolutely worth it. Thank you, Sharon. You are in my heart and my prayers.